Several early reports indicated that the launch had failed, some saying that the first stage was seen on radar to have exploded; others that the rocket disappeared from radar shortly after the payload shroud had separated. These are common times for failure, and yet the satellite is in orbit. Most likely the rocket disappeared from radar at about the time it was passing out of range, with perhaps a moment of confusion while radar tried to track the payload shroud rather than the rocket. But it does seem likely that the first stage did explode—after safely separating from the rocket. That’s a change from the 2012 launch, where the first stage fell into the ocean relatively intact and was recovered by the South Korean Navy. This could have been a late malfunction or a reaction involving unburnt residual propellant, but it could also be that the North Koreans didn’t want their southern neighbors to get quite so good a look at their rocket this time. Self-destruct mechanisms are frequently added to stages for “range safety,” to make sure no wayward rocket can land on a populated area, and it would be little trouble to deliberately activate one as soon as the first stage has done its job. Whatever minor modifications the DPRK may have made to the first stage will likely remain obscure. Assume for the moment that North Korea is sincere in its claim that it just want to launch satellites. They are calling this one the “Kwangmyongsong-4,” and saying it is an Earth observation satellite. This is plausible enough, though “Earth observation” covers everything from improving weather forecasts and crop yields to military reconnaissance and targeting. North Korea’s first satellite accomplished little, tumbling out of control shortly after launch. At this point, North Korea would probably consider it a win if its satellite could hold a stable attitude, communicate with the ground and send back a few pictures. North Korea claims the satellite was launched into an orbit that ranges from 494.6 to 500 kilometers above the earth, inclined at 97.4 degrees from the equator. JSpOC’s data indicates 466 to 501 kilometers and a 97.5 degree inclination. If we trust JSpOC more than we do North Korean newscasters, it looks like they missed their target by a little bit. The orbit they were aiming for was something called a “sun-synchronous orbit,” which is particularly suitable for Earth observation satellites as it passes over targets at exactly the same local time every day. This one will drift, but should still be serviceable. The Unha-3 rocket can probably carry at least 200 kilograms of payload to such an orbit, though its last satellite was reportedly only half that weight. Until the North has mastered the basics of satellite technology, there is little reason for it to try anything bigger or more ambitious at the moment; and little reason to use a bigger rocket that it may be developing either. The Unha-3 worked just fine three years ago; it’s the satellites that need work. Presumably when they are confident with basic technology-demonstration satellites they will move on to bigger rockets with more capable payloads. But the obvious concern is that North Korea is testing ballistic missiles and only pretending to care about satellites. The Unha-3 or Unha-4 could certainly be used as an ICBM. The upper stages generate only about half the thrust we would expect if it were built for that purpose, but it could probably still carry a payload of almost 1000 kilograms to a range of 10,000 kilometers. And with two successful tests under its belt, it could probably do so reliably. What it can’t do, quite yet, is hit anything of value. North Korea can probably build a nuclear warhead light enough for the Unha to carry, and they may well have tested one. What it has not done is tested a reentry vehicle that would survive hitting the atmosphere at roughly 16,000 miles per hour. That’s not an insurmountable technical challenge, and we expect North Korea will succeed when it gets around to it, but the North will want to test its technology at least once. Of equal importance, the North still needs to work on the rocket guidance system. If this launch had been aimed at a point 10,000 kilometers distant on Earth, rather than the perfect sun-synchronous orbit we assume was the target, it would have fallen almost 50 kilometers short and 10 kilometers west of its aimpoint. That’s an improvement over last time, but still a ways to go. And really, even if North Korea can turn the Unha-3 into a rocket that delivers 1,000 kilogram warheads with perfect reliability and pinpoint accuracy, there is still the fundamental problem that it weighs almost 100 tons, can only be launched from fixed sites and requires so much preparation that we can see it being readied days before launch. That doesn’t make for a useful weapon. What North Korea almost certainly wants for a weapon is a much smaller, road-mobile intercontinental ballistic missile (ICBM). They are working on one of those, but we don’t expect it to be operational until sometime after 2020. For now, North Korea is making small steps towards improving its rocket and satellite capabilities. What it will do with the satellites, we are not yet sure. That path may involve larger and more powerful rockets in the future. A real ICBM capability comes from following a different path, longer and less certain, and one where modest improvements in the Unha series of SLVs are of little relevance. Even if North Korea does try to adapt the Unha to serve as an interim ICBM, it will probably need one or two more tests—and the construction of hardened silos to replace the current open launch site. If the rocket is nothing new, the most important thing to look for in coming weeks is any indication that the satellite is doing something more than tumbling out of control. Even amateur astronomers will likely be able to tell that much from the flickering of reflected sunlight. If it can maintain a stable orientation, that will be an important step forward for North Korea. If it can perform any sort of maneuver using an onboard propulsion system that would be a bigger step forward, and one we would likely know about when JSpOC issues new orbit calculations. Radio signals from the satellite would mark critical progress for North Korea in another area, particularly if they occur over a prolonged period and show signs of two-way communication. Finally, if it is an Earth observation satellite, they may release images to the press to brag about how well it is working—but we will have to be careful not to be fooled if they release copies of someone else’s satellite images. To address the concern that this might be a missile in disguise, we’ll have to look closer to Earth. First, if the North Koreans are planning to deploy a weaponized Unha, they’ll need to test it at least once more to improve the accuracy, and they’ll almost certainly want to test a reentry vehicle at the same time—there’s no point in getting the launch perfect if the warhead is going to veer off course on reentry. They will also want to practice their launch preparation procedures. They were able to ready this rocket for launch significantly faster than they did in 2012, with the final, highly visible preparations taking only a few days instead of weeks; but for a weapon, they would want to bring that down to hours instead of days. If we see them repeatedly setting up and taking down rockets on the pad, that would be a dangerous sign. But even hours of preparation would probably be too long in wartime, and the North Koreans would want to hedge their bets by building hardened silos. 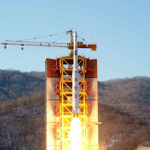 The North Koreans are good at camouflage, but the Unha may be too big a rocket even for them to hide. Should anyone find silos set up to hold Unha-sized rockets, any pretense that this is just a satellite program would vanish and we would know that North Korea is deploying ICBMs. So far, we haven’t seen any sign of that. The relevant catalog is available on-line at www.space-track.org/auth/login.